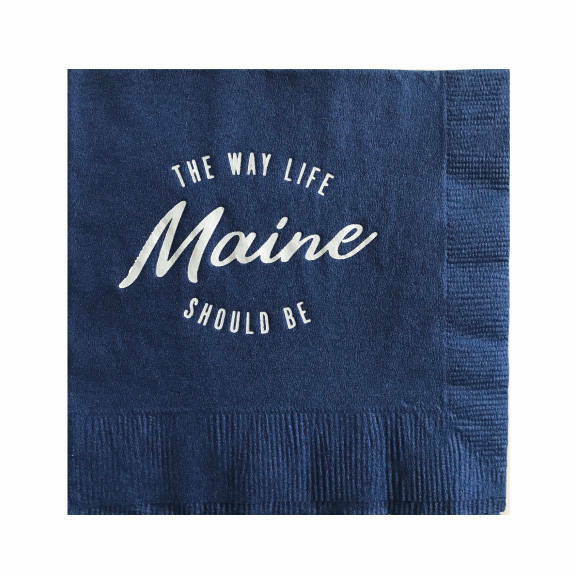 Toast to your favorite state with our Maine - The Way Life Should Be cocktail napkins! Perfect for your next trip to Maine, or to celebrate your home state anytime. The Yellow Note accepts Pay Pal and all major credit cards. Please allow 5 business days for your custom item to be designed, crafted, and shipped following proof approval. We ship using USPS First Class Mail with delivery confirmation (insurance is not included). You will be provided with tracking information along with your shipment notification. Our shipments with USPS First Class Mail typically reach their US destination within 3-5 days of shipment. Your package will be shipped to the address you provide at Etsy checkout. Please check to be sure the address is correct before proceeding to checkout. The customer will be responsible for costs associated with re-shipping packages returned to sender due to entering a wrong shipping address at checkout. We do not accept returns, refunds, or exchanges on custom items, as they are created as ordered based on your personalization and specifications. However, your satisfaction is very important to us. Please do not hesitate to contact us at theyellownote@gmail.com if you are dissatisfied with your purchase for any reason. We will work with you to make things right. Your satisfaction is our priority! We will accept returns within 15 days on non-custom items, provided it is received in the same condition as was sent. The customer is responsible for return shipping. Once the return is received and processed, you will receive a refund back to the original method of payment. Outbound shipping charges will not be refunded if the order is returned. Please don't hesitate with any questions! Complimentary proofs are available with paid purchases only. Your proof will arrive via Etsy Message (**not via email**) within 2 business days. Please reply via Etsy Message with your approval. Your order will not ship until you have approved your proof. If you require any changes / revisions on your initial proof, you will receive a second proof with the requested changes within 2 business days.